I have to admit: laziness compelled me to review this book. It is, after all, a book on murals, containing over 500 illustrations. How difficult could that be? Plus, I spent one month in 2002 as an intern at the Women’s Building in San Francisco’s Mission District. The Women’s Building is aglow with a brightly colored mural of women, hovering powerfully over the sidewalks. I had also gone on the Precipita Eyes mural tour. I had some sense of what to expect then. 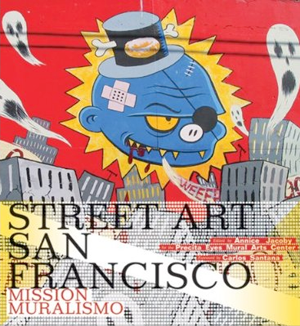 I had no idea, however, that I would devour Street Art San Francisco: Mission Muralismo, text and all, from the first page to the last. I had another misconception about this book: What could possibly be the feminist angle in a book on murals? I was pleasantly surprised, then, to find some feminist perspectives weaved, albeit in small amounts, throughout the book. For example, some of the women painted murals to teach children where food came from, and this contrasted with the male-centered murals dominating the District. The book also shared stories of how women got taunted for climbing scaffolding and how the artists of the Maestrapeace on the Women’s Building painted without any safety equipment, due to financial constraints. However, the main gist of the book is the rebellious yet incredibly expressive quality of graffiti, pop art, cartoons, stencils and murals. Despite police harassment of graffiti artists, corporate control of billboards and wall space, and capitalism in the art world, the artists of the Mission District stand firm, fight back even, in their own distinctive ways. They fight back against issues such as imperialism, ignorance, capitalism, racism, sexism, etc. The residents also deal with issues of an unjust criminal justice system, immigration issues and gentrification through their public art. Drawing and painting offered an expressive outlet with far-reaching effects like community building, an alternative to violence and an opportunity to raise awareness—in their own voices. The book is 304 pages, which covers over three decades of street art. It’s written by over twenty activists and artists, including a foreword by Carlos Santana, who grew up in the District. I came away from reading this book with a renewed interest in public art and a better appreciation for graffiti artists. I bet this book will pleasantly surprise readers, especially those interested in the mix of art and social justice issues.